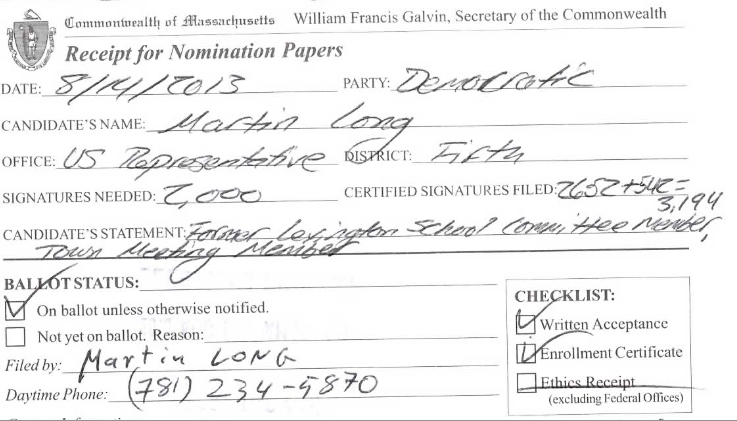 As of this afternoon, the Secretary of the Commonwealth has certified that I am a Democratic candidate for Massachusetts’ 5th Congressional District. I collected significantly more than the 2,000 signatures required for ballot access. The campaign website, MartinLongForCongress.com will be up in mid-August. Please stay tuned. My book, The Reagan Memes: The Path from Reagan Conservatism to Modern Day Gridlock (and how to get out of it) will also be available on Amazon in mid-August. Stay tuned for more on the book as well. This has been an exciting few weeks, and will undoubtedly be a ton of fun over the next ten weeks (that’s right, only ten weeks until the primary). I write to you today in your capacity as Chairman of the Presidential Commission on Gun Violence. But first: a very happy new year to you, your family and your staff. I fondly recall learning to shoot a .22 rifle at Boy Scout camp oh those many years ago. I’ve had little direct experience with guns since then. But I do not write to you today as an anti-gun polemicist. My partner’s sister has a close relationship with the family of one of the victims of the Sandy Hook shooting. Consequently, I hear stories of the aftermath of that tragedy. But I do not write to you today as someone who claims any special insight into the horror of what humans are capable. Rather, I write to you as a great believer in data and thoughtful consideration based in the empirical. I’m certain that you will receive a wealth of advice on approaches to take towards gun control. Accordingly, I’ll restrict my suggestions to you to just two issues. First, I suggest you do all within your power to repeal the Tiahrt Amendment. As you know, the Tiahrt Amendment prohibits the Bureau of Alcohol, Tobacco, Firearms and Explosives from releasing information from its firearms trace database to anyone other than a law enforcement agency or prosecutor in connection with a specific criminal investigation – and greatly limits the kind of information that can be released even to law enforcement. Without the data on crimes that were committed with assault weapons, we cannot, as a society, have a rational discussion about gun violence. The ATF has information about the types of guns that were used in shootings, but are prohibited from sharing with the media, researchers and the public. It seems obvious why the gun lobby would want to restrict this information from public eyes. But the time of keeping it hidden must come to an end. Therefore, I hope you can support including in any legislation that arises from the Commission on Gun Violence a provision directing the ATF to release all of the relevant information they have collected to date on the use of firearms, and to periodically (and thoroughly) update and release it to the public. Second, I’d suggest that you look into federalizing regulations not just for assault-type weapons, but also for concealed weapon permits. As you know, Marianne Hammer of the NRA has been effective in liberalizing state concealed weapon legislation (initially in Florida) to so-called “shall issue” laws. The effect of this, as intended by the NRA, is that states no longer have discretion in issuing concealed carry weapon permits. Mr. Vice President, I wish you luck with this Commission and in all of your pursuits and hope that one thing that can come of our re-evaluating our guns laws, is to assure that we take advantage of all of the information that we have about their uses, illegal and legal. P.S. I will publish this letter, in the form of an open letter to the Vice-President, on my blog: http://www.BornAgainDemocrat.com. With all the flap about Mitt Romney yesterday (in case you were asleep, the New York Times published an article about a group of Republican strategists pitching to at least one billionaire to get the $10 million needed to fund a campaign against Obama based on his former pastor’s statements a long time ago). Mitt Romney to his credit, quickly came out to distance himself from these efforts. There has been much written about his motivation this time (he recently did not criticize a woman in Ohio who called for Obama’s trial for treason). Some have said that Romney is trying to stay focussed on the economy and is having trouble corralling the conservative cats on the Republican activist right. I have a much simpler suggestion as to why Mitt Romney went public to criticize this so quickly: He has been lucky not to have any overt discussion about Mormonism during his election so far. Any momentary schadenfreude he might experience reading about Wright and Obama would be overwhelmed by his horror at the thought of having to have an open dialogue with those who would criticize all the crazy in Mormonism. If Obama were indeed to go negative, that’s so very obviously the place to go. Do you think if Obama were the Mormon that all Republican groups would let it go? I read an interesting article this morning about openness in government. Specifically, tracking the implementation of a House of Representatives rule adopted in January 2011 requiring that video of hearings be made available online. If you had to guess, which committee was the laggard, what would your guess be? Appropriations. That makes tremendous sense, as that’s where the government starts to decide where our money is spent. And it’s also the place where there is a great deal of lobbying. Putting the video of those hearings online would, of course, make it easier for the American people to see just how the decisions surrounding which agencies gets our money are made. Rules rules rules. This would be a good one to make sure the House of Representatives actually follows. On April 9, 2012, the Federalist Society of Duke University hosted a debate on the Affordable Care Act. At about 28:30, Prof. Barak Richman unleashes a cogent argument on why it was that the Supreme Court did a terrible job in their recent oral arguments on the Affordable Care Act. This is one of the most relevant commentaries on the Supreme Court. It actually enlightens, with respect to the recent oral arguments. Why is The Affordable Care Act being challenged as un-Constitutional, but Medicare is not (and Medicare really is a command/control program, according to Prof. Richman). Maybe you read about how Gawker has had a mole inside Fox News. Well, he got caught and is now public. Watching this video, I felt two contrary and competing emotions: horror and attraction. Horror, due to Mr. Romney clearly not understanding that he is an elitist and that he comes off as one. I genuinely felt sorry for the guy. There can now be no doubt that he has a Ross Perot-sized tin ear. Attraction, because I found myself realizing that this video actually shows Mr. Romney as more human than anything I’ve seen before (and he was my governor for four years). He’s sitting around, chewing the fat with Mr. Hannity — someone he is clearly comfortable with — talking about his wife and their mutual love of horses. This simultaneous revulsion and attraction towards Mr. Romney was a new combination for me. It’s release will, of course, only exacerbate Mr. Rommey’s elitism problem. If the poor guy could only learn to show a little bit of the normal humanness that he lets out of the lock-box for his Hannity-banter, perhaps he could actually communicate with people. Perhaps he’s so repressed that he purposely keeps everything bottled up inside just so he doesn’t come off poorly. If so, that strategy clearly isn’t working. My suggestion: spend some time with regular people and try to connect with what they find interesting. You just might find some common ground and seem human. Then again, maybe you really don’t have any common ground with regular people. In that case, I can only say, congratulations President Obama, you’ve been re-elected.